The vast majority of students who study abroad in college consider the experience to be among the most enjoyable and transformative experiences of their undergraduate years. Nevertheless, students often report that the process of transitioning back to life in the United States and at UNH can be a challenge. In September 2014, the Center for International Education and College of Liberal Arts (COLA) Center for Study Abroad teamed up to put on UNH’s inaugural What Now? What Next? Study Abroad Reentry Workshop & Reunion. With the second Workshop having successfully taken place in February 2015 (despite having to reschedule due to one of our many winter storms! ), we plan to offer it each semester to serve students immediately upon their return from abroad. The Reentry Workshop focuses on two important areas: the personal and emotional response to the reentry experience, and the strategies and resources available to keep the international experience meaningful for students both during the rest of their time at UNH and after graduation. The workshop leaders wanted students to leave with the feeling that they were now part of a larger education abroad community. The goal was to create a program that would involve a short time commitment (two hours in the evening), yet would provide students with practical tools, promote awareness of campus resources and opportunities, and foster an environment of peer support. Students heard from guest presenters from the UNH Counseling Center about resources and support available on campus to help students cope with reentry and process their study abroad experience. 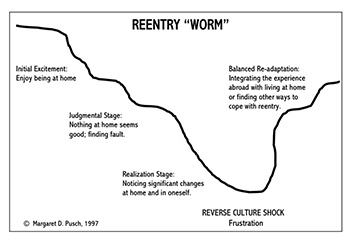 They discussed the stages of reentry (see “Reentry Worm” figure below), various individual responses to each stage, and coping mechanisms to manage the frustrations one can encounter with transitioning back into life at home. 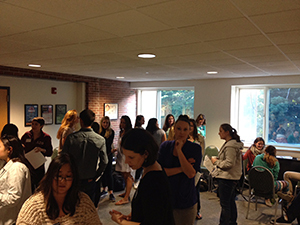 Students then did a group exercise to talk about the challenges of articulating the impact of their study abroad experiences to friends and family back home. They worked in groups to tackle the inevitable question that all returnees get asked “how was it?” They prepared a 3-second, 3-minute, and 30-minute response for different audiences. A panel of enthusiastic study abroad alumni answered questions about their own reentry coping mechanisms, what they were currently doing to keep their international experiences alive, and how those experiences fit in to the plans they were making for post-graduation. The “What Next?” portion of the workshop included presentations from UNH’s Career Services and Office of National Fellowships on how to keep the international experience alive after college. Returnees were reminded that employers value a diverse and inclusive workforce of culturally well-rounded people, and learned how to highlight their newfound international experience on their résumés and in interviews. They also learned about Going Global, UNH’s worldwide employment database and the numerous opportunities to travel abroad after college by applying for international scholarships and fellowships that are geared towards recent college graduates. Finally, workshop leaders ended the program by urging returnees to continue their cross-cultural learning process by engaging with the multitude of internationally-focused opportunities here on campus. Examples include Buddies without Borders, CIE’s Global Ambassador Program, area-focused research opportunities, student organizations, or simply engaging fellow students in conversations about their experience abroad. Workshop leaders hope to continue to help returnees reorient themselves toward using that experience to better define their continued path at UNH and into their futures.